Over one hundred years ago, Max Weber argued that Protestantism “disenchanted” the world and eliminated “magic” from it. Today, as we celebrate the 500th anniversary of the Protestant Reformation, … this assertion needs to be reappraised. Did Protestants really vanquish “magic,” and, if so, what was that “magic,” exactly, or the “disenchantment” that accompanied its demise? Exploring the various ways in which Protestantism redefined the sacred might…allow us to appreciate more fully what the Protestant Reformation bequeathed to the world. Eire’s clarion call to discover how Protestantism redefined the sacred is refreshing, but, as he notes, the ghost of Weber remains a stumbling block, leaving Protestantism misunderstood. So, too, I would add, his ghostly presence leaves the Middle Ages misunderstood, and underestimated, too. Our period is the “enchanted” world that Protestants allegedly lost, like Adam and Eve all over again, just a placeholder in someone else’s historiography. So, since these misconceptions are costly for mutual understanding and in shrinking market shares of the Humanities, let’s take a moment to remember what the Medieval era bequeathed the Reformation, and how heavily Luther and all who came after depended on it. 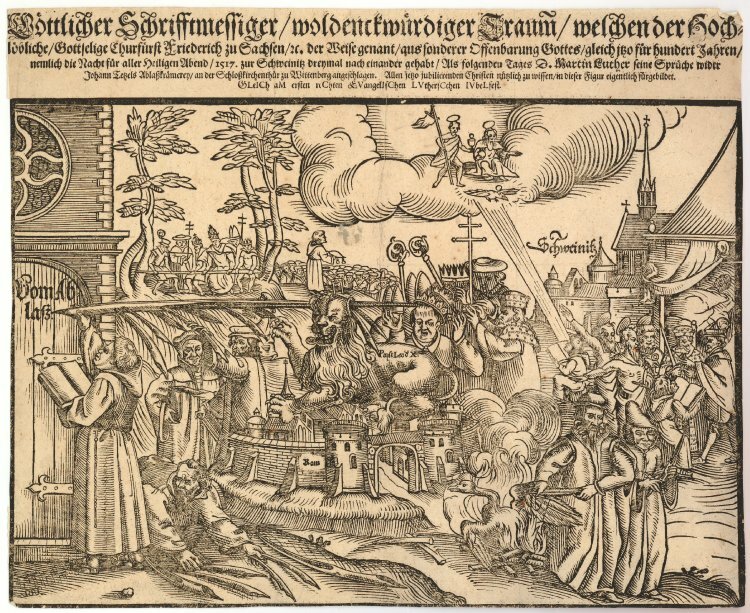 A 1617 broadside on the centenary of the German Reformation, “Göttlicher Schrifftmessiger…,” showing Luther’s posting of the 95 Theses in Wittenberg. His over-sized pen knocks off the tiara of Pope Leo X.
Weber had argued that the “ascetic” strand in Protestant ethics was a major factor in the rise of Western capitalism, and that the “disenchantment”(Entzauberung) so evident in Modernity stemmed originally from a devaluation of mysticism, “magic” and other (supposedly) pre-Modern worldviews. For Weber, “disenchantment” grew out of mental habits of “rationalization,” which, along with burgeoning bureaucracy and valorization of the scientific, contributed to modern secularism. 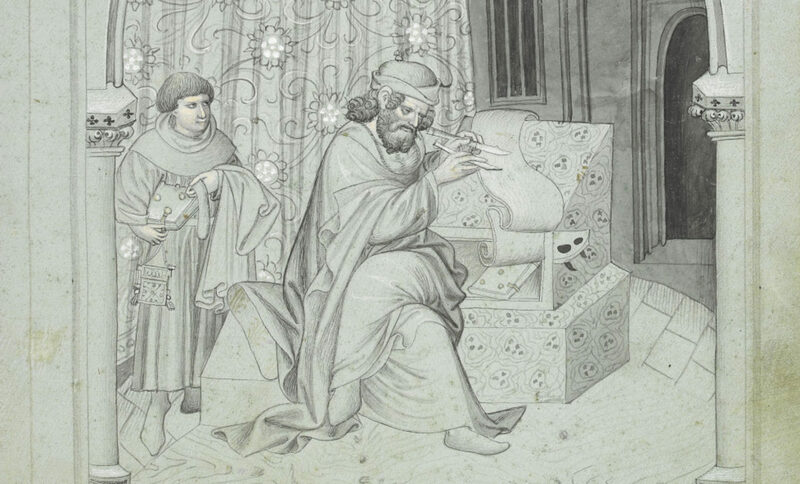 Little did Weber know that the Middle Ages were rife with their own forms of rationalization, bureaucracy, and secularism (scholasticism, laicization of the civil service, and disillusionment with clerical corruption and schism). In contrast, for traditional societies, Weber argued, “the world remains a great enchanted garden”. Mercifully, Weber’s patronizing vision is mostly behind us, but not far enough. Eire argues, rightly I think, that types of “enchantment” survived on both sides of the Reformation Protestant-Catholic divide, with different emphases in each religious culture, and, I’d stress, different aesthetics: e.g. Protestant painters like Rembrandt painted less medieval iconography, but experimented with inner and outer light; Protestant poets like Spenser reinvented medieval romance’s “enchanted” world as a four-part invention of inner and outer voices. But still missing from this more holistic picture is the recognition that, however many “disenchanting” attitudes one believes Protestants unleashed, they were already unleashed in the Middle Ages, itself as varied and unstable as any other period in history. Whoever these unbelievers were, then, they were highly literate, apparently readers of Latin with access to the Old and New Testament – part of the establishment. Medieval attitudes toward vision could range widely from the devout, like Peter (who nonetheless verified his witnesses officially) to skeptics, like Archbishop John Pecham (who in the 1270s questioned Hildegard of Bingen’s visions using historiographical methods worthy of later Renaissance humanists), to outright deniers, like John Wyclif (who denounced Hildegard’s visions as “extra fidem Scripture”). What allowed Luther in 1517, then a Wittenberg professor of moral theology, to commit his famous act (actually a routine act at the time) of nailing up theological propositions for dispute was the fact that medieval universities had rights and privileges. He posted the Ninety-Five Theses (or Disputation on the Power of Indulgences) on the door of the Castle church (in fact, often used as Wittenberg’s university “billboard”), an action that depended upon a series of medieval inventions and precedents. First, a university had a right to some degree of self- governance independent of the local bishop, and to some forms of academic freedom (not so large as our own, but worthy ancestors of them). So, for instance, in 1290 Godfrey of Fontaine wrote his Quodlibet VII on whether a master of theology may contradict an article condemned by a bishop (“Utrum magister in theologia debet dicere contra articulum episcopi si credit oppositum esse verum”), deciding, strikingly, that on truths necessary to salvation a theologian should not comply with a condemnation he disagreed with, even if others are “scandalized” by his disobedience. Those outside of the protection of the university could be less fortunate: Godfrey later wrote an approbation of Marguerite Porete’s mystical work, which, however, did not prevent her tragic execution in 1310. 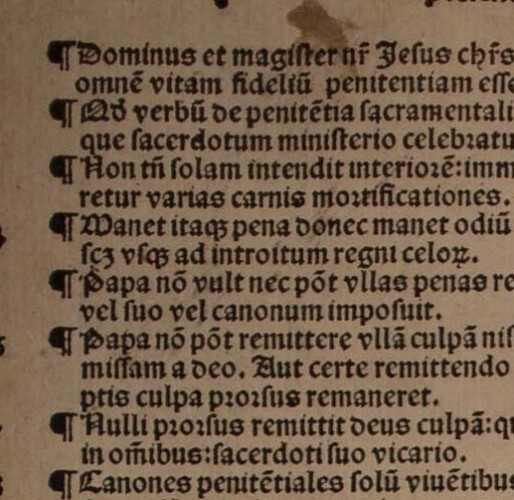 Second, Luther had access to the technologies of medieval book and pamphlet production – like the university, the printing press, too, was a medieval invention, but the pamphlet genre was even earlier, as was the broadside. Third, in medieval university contexts, lists of “points” or topics for disputation were common, while “conclusions,” a related genre, were considered more aggressive. Famously in England, the Twelve Conclusions of the Lollards were affixed to the doors of both St. Paul’s and Westminster Hall in 1395, though the genre does not itself imply heresy. In fact, medieval universities had developed a very specific set of loopholes for academic freedom, from the famous Paris condemnations of 1277 (which reached even to Thomas Aquinas), through John XXII’s persecutions of dissenting academics, and beyond, resulting in an intellectual tradition of disputations probing the one problem that could override any episcopal censure: the question of what was necessary to salvation. I would argue, then, that it was precisely on such matters of “truths necessary to salvation” that many reformers, including Luther, benefited from a protective umbrella, to some real extent, developed – and not without pain and sacrifice – by academics in the Middle Ages. Lest we forget. 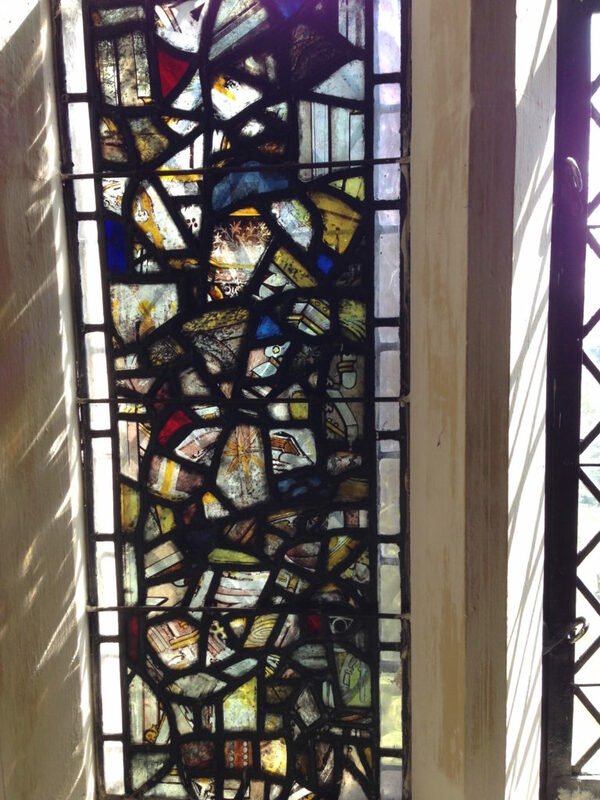 Medieval stained glass fragments gather after destruction by Cromwell’s soldiers, Ripon Cathedral, Yorkshire. So, when medievalists look at Luther 500 years later, they think not of rupture, but continuities – all the earlier times history came so close. Instead of thinking of the Reformation like the smashed fragments from Ripon Cathedral’s medieval windows (above), we probably think instead of one of the literally thousands of intact medieval windows across Europe, like the one from York’s Holy Trinity Goodramgate (below) of family-friendly saints smiling down upon the altar for centuries, over the Early Modern tablets bearing the Creed and Commandments in English. What divides us is never greater than what unites us. 15th-c East window of Holy Trinity, Goodramgate, York, with (bottom row) female saints, biblical families and Holy Trinity (centre). For close-ups of each see Corpus Vitrearum. 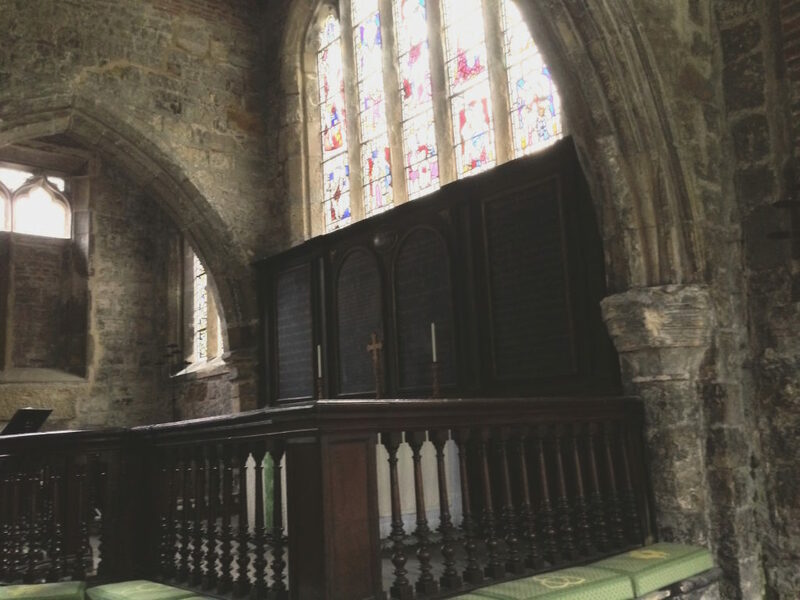 The same window in situ, with Early Modern tables of Creed and Ten Commandments above the altar. My thanks to Mike Johnston for creating one welcome exception, Purdue University’s “The Meaning of the Reformation” conference where this paper was first given Nov., 2017. I quote here from Eire’s blurb for “Reshuffling the Seen and the Unseen: A Reappraisal of the Legacy of the Reformation,” given Oct. 17, 1017 at University of Victoria for The 500th Anniversary of the Reformation series. See Eire’s, Reformations: The Early Modern World, 1450-1650 (New Haven, 2016). Max Weber, The Sociology of Religion(Boston, 1971) p. 270. See the Chronology Chart in K. Kerby-Fulton, for Books Under Suspicion: Censorship and Tolerance of Revelatory Writing in Late Medieval England(Notre Dame, 2006) xix –lii (BUS); and “Skepticism, Agnosticism and Belief: The Spectrum of Attitudes Toward Vision in Late Medieval England,” in Women and the Divine in Literature before 1700: Essays in Memory of Margot Louis, ed. K. Kerby-Fulton (Victoria, 2009) 1-18. Quoted here from Robert Easting and Richard Sharpe, “Peter of Cornwall, The Visions of Aisli and his Sons,” Mediaevistik(1998): 248, from Peter’s Prologue. Andrew Pettigree, Brand Luther(London, 2015) 71. The Castle Church functioned as a classroom in the university, and its door was used as a billboard. BUS, 38-9. For a similar case involving the privileges and liberties of Oxford (libertatum et privilegiorum universitatis Oxoniensis), see BUS,3. In Europe, but in China mechanical printing dates from the 8thc. C.E. Hudson, Select Wycliffite Writings, (Toronto, 1997) 150. 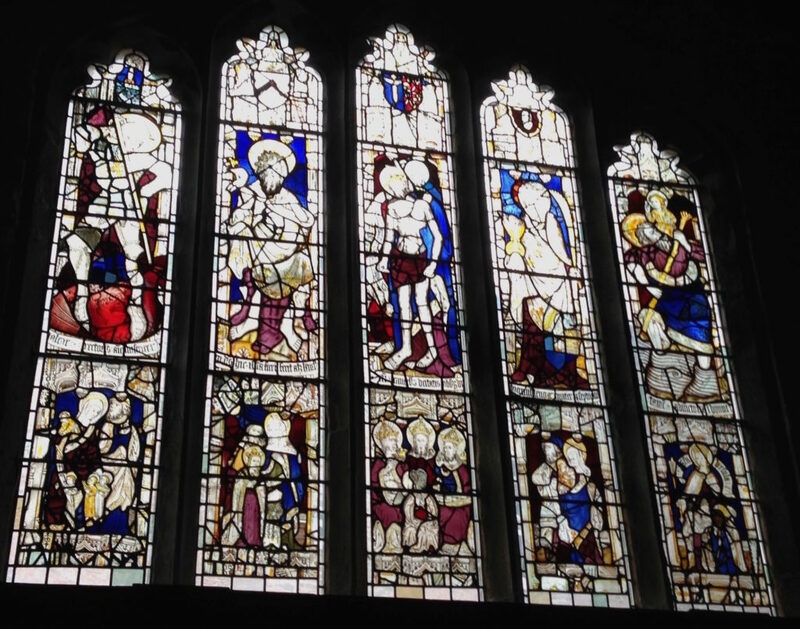 Sarah Brown, “Reformation, Iconoclasm and Restoration Stained Glass in England c1540-1830” http://www.buildingconservation.com/articles/english-stainedglass/english-stainedglass.htm. Next PostNext Undergrad Wednesdays – Manic Pixie Dream Grisilde: Was Geoffrey Chaucer a Medieval Cameron Crowe?